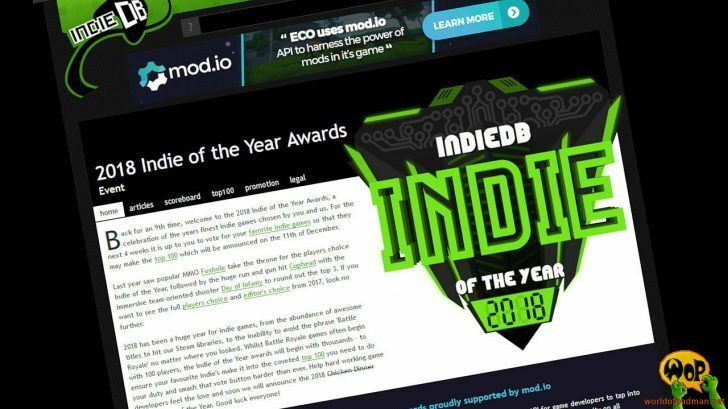 IndieDB just kicked off its annual Indie of the Year Awards for the 9th time. Like all the years before, you have the chance to vote World of Padman into the Top 100 Indie Games within the next 10 days. To do so, simply visit WoP’s IndieDB game profile and click the “vote now” button. The good thing is, that you can win awesome games from the IndieDB community, when you are part of it. So, vote for us while you are logged into your IndieDB account. The list of the Top 100 Indie Games will be revealed on December 11th, followed by another 10 days of voting to determine the Indie of the Year 2018. Our goal for this year is simply to get ranked again under the Top 100. We are looking forward. Last year we missed the list by only 50 votes missing, we reported here.